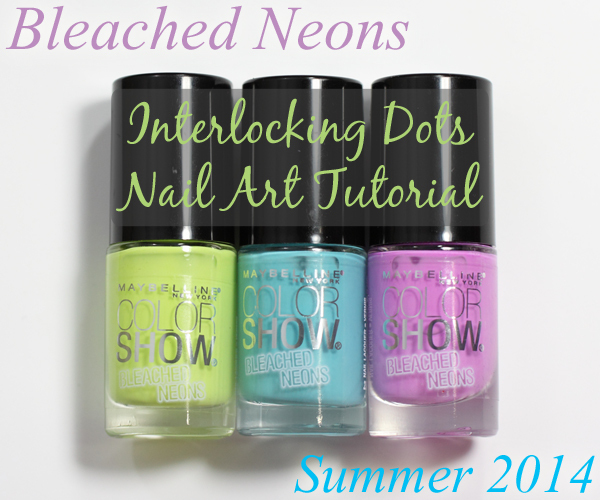 Normally, when I see a neon nail polish collection, I cringe a bit inside. While bright and fun, neons are notorious problem children. They are plagued by opacity issues, streaks and the need for a white base coat. In other words… TOO.MUCH.WORK! Thankfully, we’re seeing some non-traditional neons this season, like Essie’s version and now the Maybelline Color Show Bleached Neons, which are a not-so-in-your-face take on the day-glow brights we typically associate with the genre. I decided to tackle one of my first PinspiratioNAIL pins, a look I’ve been wanting to try for a while now, with these punchy new shades. During the TV slump that occurs every year between the season finales and the start of my fave summer guilty pleasure, Big Brother, I find myself aimlessly channel surfing on my nights home. A couple weeks ago I hit on The American Baking Competition, featuring a self-proclaimed “redneck” named Francine firing off gems like, “it’s slap your mama good!” I couldn’t resist. During one of the episodes, the competitors were challenged with making croquembouche, a tower of creme puffs (or choux) held together with threads of caramelized sugar. It made me think of the spun sugar nail art designs I’ve been eyeing on Pinterest. 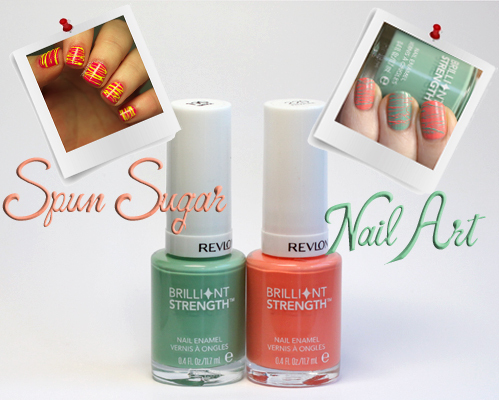 Using the new Revlon Brilliant Strength Nail Enamel, I decided to give the look a try. Since I work from home, daytime TV is my background noise and one of my can’t miss morning shows is the Today Show “Drunk Hour” (aka KLG & Hoda). I’m not gonna lie, Kathie Lee bugs the crap out of me some days and, when I first started watching, I thought for sure that Hoda would slap her someday. They’ve grown on me over the years and now I just roll my eyes at Kathie Lee like she’s a batty aunt. Anyway, the point is, every day is something different on the show; Wine-sday (Wednesday), Thirsty Thursday, etc. and today happens to be Try-day Friday, when they try something new. This morning it was chocolate babka, yum!! It’s in honor of that concept that this PinspiratioNAIL was born. If you recall, PinspiratioNAIL is my riff on a look I find on Pinterest. Today I wanted to attempt a new-to-me technique, Watercolor Nail Art (or Marble Nails). The name is open to interpretation. Anyway, I’ve seen a few different tutorials on how to create the watercolor look but, given my amateur skills, I wanted the simplest possible method. For my sake and yours. Check it out! When it comes to polka dots on nails, I tend to be pretty straightforward in my looks. Partly because it’s easy (and I’m no nail art savant) and partly because I’ve just never had the creative vision to come up with something totally unique. I blame my left-sided brain. I’m much better at riffing (not ripping) off what others have come up with, which is why PinspiratioNAIL was born. I keep playing with the idea of dots inside dots, dots layered over dots but a lot of my practice designs have come off flat. Then I came across this graphic, retro-inspired design from My Awesome Beauty and my motivation kicked in. 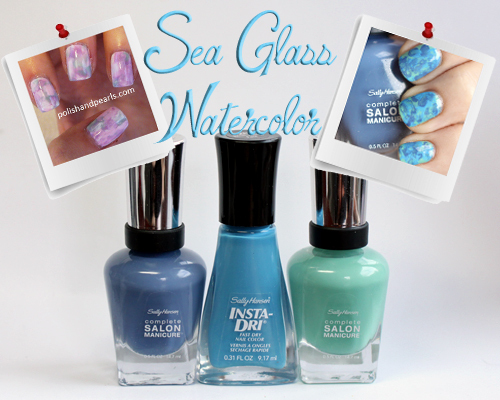 Having recently received the new Physician’s Formula Endless Color Custom Nail Trios, to test, it seemed like the perfect time to give this three color design a try. If you look back on the ’80s with great nostalgia, as I do, you should have your DVRs set for the National Geographic mini-series The ’80s: The Decade That Made Us starting this Sunday, April 14th. Bonus: it’s narrated by my number one celeb crush, Rob Lowe. Though I’m still waiting for a “The ’80s” movie like the ones NBC produced for The ’60s and The ’70s. IT’S TIME NBC! 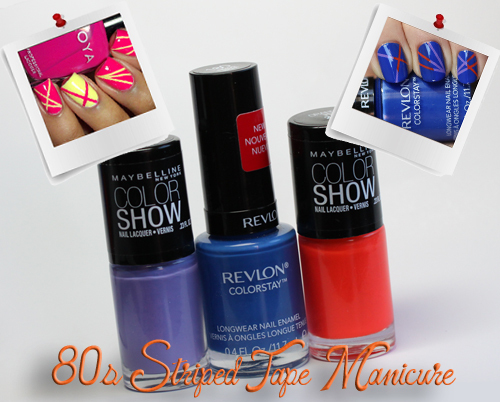 In anticipation of the mini-series, I’ve been on a non-stop 80s pop listening spree on Spotify and thought some fun ’80s inspired nails would be perfect for my next PinspiratioNAIL challenge. I put my twist on a look I found on Pinterest using poppy brights from the Revlon ColorStay and Maybelline Color Show nail polish lines.